[prodDesc] => Characteristic menthol flavor and aromatic, relaxes the body and great digest aid. Renown around the world, the peppermint from Oregon and Washington are among the coolest and intense in menthol. During hot summer months, make an iced tea, by brewing double strength and serve on ice. Use 1 cup of hot water per teabag. Bring to a boil fresh water, pour over 1 teabag per teabag. Let steep 5 minutes. Remove teabag. [prodDesc] => The ideal cure for your office cravings! Six DEAN & DELUCA signature cellos that satisfy sweets enthusiasts, salty snack lovers, and chocoholics. [prodMetaDesc] => The ideal cure for your office cravings! Six DEAN & DELUCA signature cellos that satisfy sweets enthusiasts, salty snack lovers, and chocoholics. [prodDesc] => The perfect gift giving for wine lovers. [prodMetaDesc] => The perfect gift giving for wine lovers; featuring Shiraz Cabernet Sauvignon, Sauvignon Blanc Semillon, Blackberry & Bay Leaves Jam, Olive Leccinno and Chocolate Bar. [prodDesc] => Kusmi Tea presents Kusmi Exclusive Blends, a round white chest inspired by the elegance of a hat box. Our assortment of 42 enveloped muslin tea bags invites you to discover the best of Kusmi Tea, all inside our new presentation box.Prince Vladimir, Anastasia and St Petersburg represent Kusmi’s famous Russian taste based on citrus fruits. Flavoured green tea lovers will be pleased by Imperial Label’s orange and cinnamon notes. 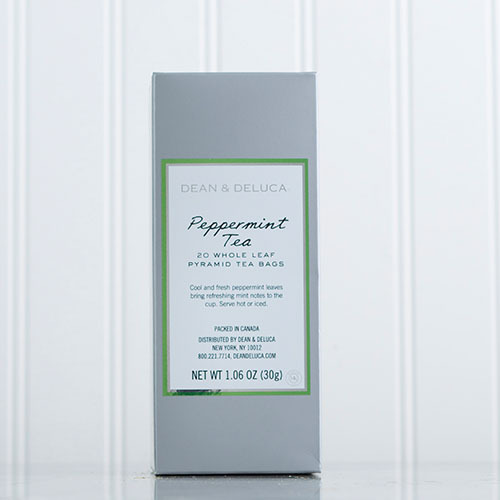 Because of its refreshing taste, the spearmint green tea is ideal for after meals. Finally, black tea lovers will be thrilled by Russian Morning N°24, a blend of black teas from China and Ceylon, which is perfect for breakfast. Characteristic menthol flavor and aromatic, relaxes the body and great digest aid. Renown around the world, the peppermint from Oregon and Washington are among the coolest and intense in menthol. During hot summer months, make an iced tea, by brewing double strength and serve on ice. Use 1 cup of hot water per teabag. Bring to a boil fresh water, pour over 1 teabag per teabag. Let steep 5 minutes. Remove teabag.